It's no more news that the windows mobile OS is gradually dying off as it continues to loose more market shares and even Bill Gates who happens to be the one of the founders announced sometime ago that he has ported to android OS. Since the hardware isn't really working for the Windows mobile team, they have decided to invest more on the software aspect by making their mobile apps such as full office suite, launcher, selfie all and others available for android and iOS. Now the company has added the famous edge browser to the list. About 2 months ago, Microsoft officially announced its intention to make the super sleek edge browser available for android and iOS users, but it was only available for beta testing as at that time. Now Microsoft has just announced the stable version of the edge browser for both android and iOS users. The edge browser isn't really much different from the various mobile browsers we are used to except for the ability to syncs with your desktop Edge for passwords, favorites, and browsing history. It also features integrated QR code reader and voice search. 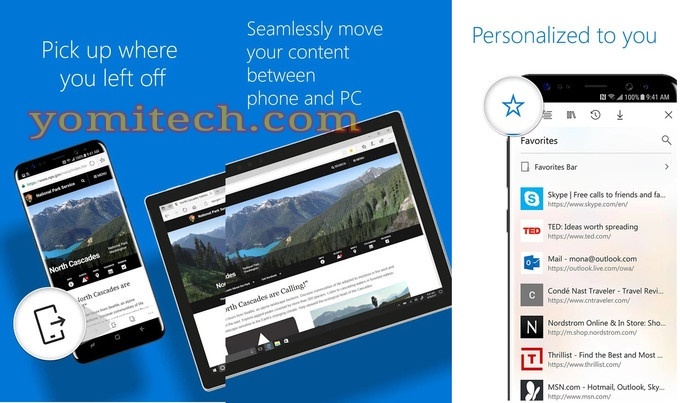 Below are some of the features of Microsoft edge browser for android and iOS. >> Ability to sync your information (passwords, favourites, browsing history) and use them across your devices – PC, tablet and smartphone. >> Incognito Mode for more privacy on the internet. The stable version of edge browser is not available on the PlayStore for android users and AppStore for iOS users. Incase it's not yet available in your region, you can get it from the link below. For Android Users, Download Microsoft Edge browser HERE. For iOS Users, Download Microsoft Edge browser HERE.